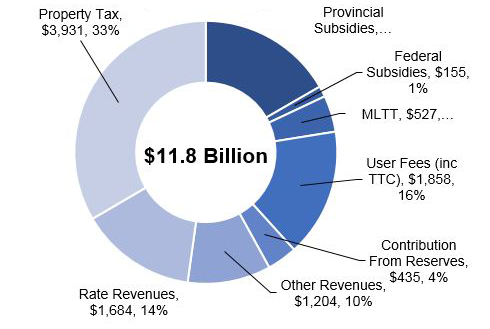 The City of Toronto’s main revenue source is property tax, which accounts for about 33% of the City’s total operating budget. The City has also has three rate based programs, Toronto Water, Solid Waste Management Services and Toronto Parking Authority. These programs are funded entirely by the user in the form of fees. For example, your water and garbage costs are calculated by how much water you use and the size of your garbage bin. Some City services or programs such as the TTC and recreation programs have user fees which pay for a portion of the service. Reliance on property tax – the City’s most important and stable revenue source – has decreased over the past six years. Council has made long-standing decisions to hold overall property tax increases at or below inflation. In recent years overall revenue growth has been supported by increases in utility rates for water and solid waste, transit fares and other user fees, and the rapid growth of MLTT revenues. Revenue Quality – the growth/stability of the revenue compared to an equivalent marginal property tax increase. 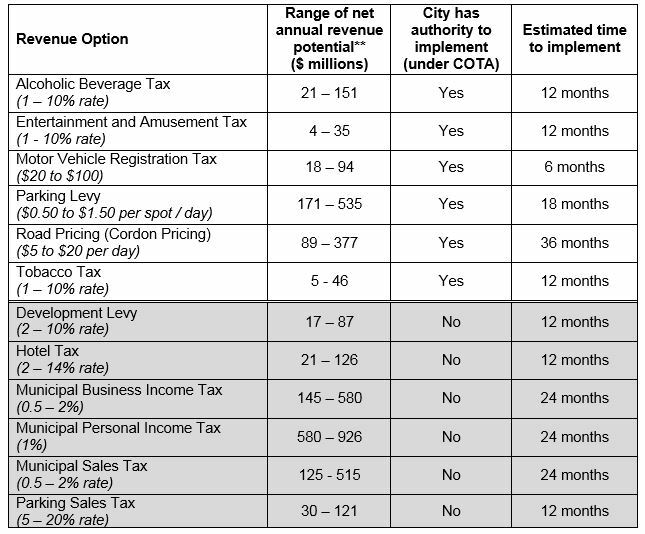 *The above is not an inclusive list or existing revenue sources, but an example of the types of revenues the City could collect. What revenues or taxes can the City collect? The City of Toronto Act (COTA), 2006 provides the City with broad and permissive taxation authorities commensurate with its size, responsibilities and status as an order of government. Revenue options under the COTA that have been implemented include the Municipal Land Transfer Tax (MLTT), Personal Vehicle Tax (subsequently rescinded) and Third Party Sign Tax. Property tax is the City’s primary revenue source for municipal services. It is collected on residential and non-residential or commercial properties. As a share of the City’s total budgeted own-source revenue, property tax has dropped from 60% in 2006 to 49% in 2016. Limiting residential property tax increases to the rate of inflation has translated into an overall property tax increase that is actually less than inflation (tax rates for non- residential properties are increased at one third the rate of the residential property tax class). Toronto’s municipal property tax rate is the lowest in comparison with those in the Greater Toronto and Hamilton Area (GTHA). The MLTT has been a source of tremendous revenue growth for the City since its implementation, a period that has coincided with very robust activity and price appreciation in the Toronto real estate market. The MLTT has a relatively narrow incidence, with approximately 70,000 transactions a year and with a very high individual transaction cost at almost $10,000 for a $700,000 home. This tax applies to the owners of all third-party signs in the city with a sign face area greater than one square metre. Proceeds from the tax are used to provide a stable source of revenue for the new Sign Bylaw Unit. Surpluses have been used to fund arts programs? An external consultant’s Revenue Options Study of options both permitted and not permitted under the COTA was tabled at Executive Committee in June 2016.. The study looked at the potential revenue, estimated time to implement and the impacts on residents and businesses. The relative narrow incidence and higher variability of alternative revenues in comparison to property taxes exposes the City to future operating budget shortfalls when revenues decline. Often revenues are viewed more positively by the public if they result in noticeable new service or infrastructure expenditures. Allocating new tax revenues to specific capital projects or programs may help to address these issues. City Council directed staff to explore asset optimization, including consideration of how possible proceeds from the partial or full sale of assets could be used to address the City’s capital deficit. * A report to Executive Committee in December will have more detailed analysis. **These estimates may not reflect significant administrative complexities/costs. These details will be brought forward in the December report to Executive Committee.